The DC-80 is a portable D.C. power supply ideally suited for use with hand-held attachments and small weld heads. The DC-80 is ideal for precision welding of miniature parts and plated materials such as bi-metal contacts, tungsten filaments, miniature relays, and precious metal accessories. The DC80 operates on 110-115 volts AC. 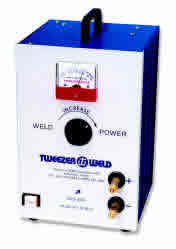 A receptacle is located at the rear of the unit for connection of a foot switch or a weld head initiation micro switch.